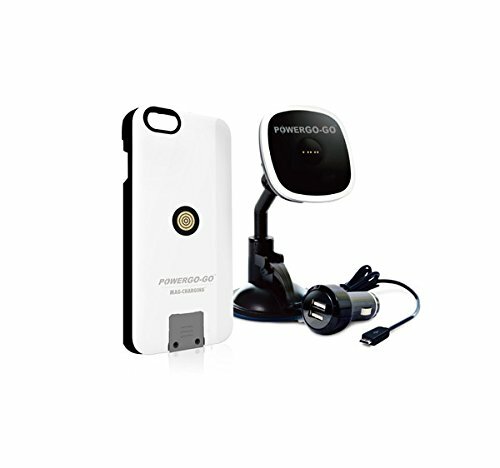 Power up your Apple iPhone 6S with this POWERGO-GO Magnetic wireless charging car charger bundle set. This powerful and high efficient charging technology can be charged up-to twice as fast as competing Qi wireless charging technology. This iPhone 6S car charger bundle set includes 1 wireless charging case for iPhone 6S, and 1 Magnetic wireless car charger that you can use when drive, the car mount will hold tight your iPhone securely while charging. You can read the Map easily as the Magnetic system allow you to rotate your cell phone easily compare with traditional car mount that need to adjust the side clip. Easy connection - just snap on the charging case or power bank and allow the embedded magnetic technology to connect the receiver with the transmitter for high-efficiency charging. Eco-Friendly gold coated connectors ensure optimal power current flow by minimizing energy lost between the receiver and transmitter during the charging process. Data sync support engineered circuitry design that enables data synchronization for music, photos, video and backup files. If you have any questions about this product by POWERGO-GO, contact us by completing and submitting the form below. If you are looking for a specif part number, please include it with your message.